Ashley is PolishAddicted: December Nail Art Theme Week - Elevation Polish Bamboo Nails! 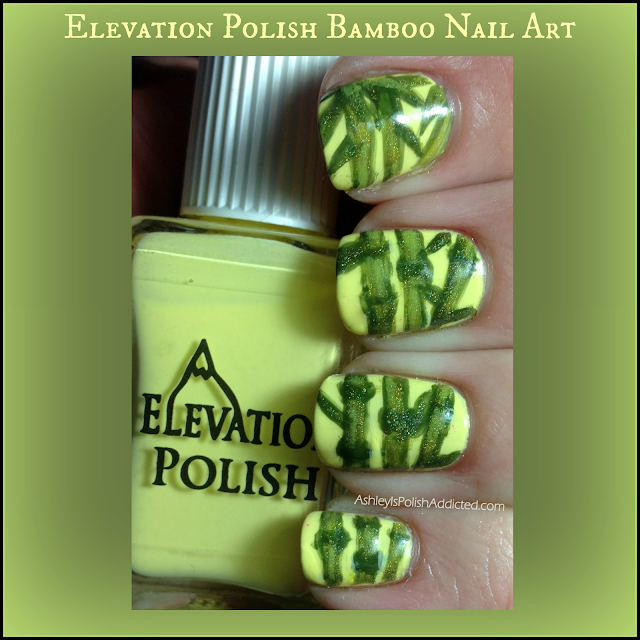 December Nail Art Theme Week - Elevation Polish Bamboo Nails! previously sent as PR samples. Happy Friday everyone! I have the last mani for Japanese Theme Week today. I chose to do Bamboo Nails and I'm really happy with how they turned out! For this mani I used all Elevation Polish colors. Mount Ventoux is my yellow base and I used Xixabangma, Epidote and I Got the Axe for the bamboo stalks (click on the name of each polish to see my previous post about it). I hope you enjoyed this month's theme week! I enjoyed it much more than I thought I would! WOAH!! This is so beautiful!!! I totally LOOOOOOVE this mani!!! I did suspect Xixabangma was involved.